It’s all back by popular demand! The JPW 40 to Follow ebook (release date 25th October) and our Cheltenham Ante-post Service (starting on 15th November). ​​​​​​​The National Hunt Season runs from 13th October 2018 to 27th April 2019. It’s no secret that we love the National Hunt season. In fact we are obsessed by National Hunt Racing and live and breathe everything about it. JPW Racing Tipster is very well respected within the industry when it comes to the Jumps. We still like Flat Racing but give us a 3m 2f Cheltenham Gold Cup over an Epsom Derby any day of the week. Ultimately it is where we are most passionate and where we have an encyclopedia of knowledge. We love it so much that we write a book about it, year after year giving you our horses to follow for the season. The work on the book began over 3 months ago and we can hardly contain our excitement until it is released. The finishing touches are being put together as we speak and once again everyone is in for a treat. If you thought last years book was good, wait until you see this years. It’s also no secret that the Cheltenham Festival is our favourite Festival of the year. We help the excitement build up by offering a Cheltenham Ante-post Package that includes one tip per week in the run up to the Festival – for 17 weeks! In total the book produced a HUGE 60 winners last season. It was easily the best book on sale in terms of winners and profit made. This book was a huge hit for us last year. It was produced an incredible amount of winners. At the time it was released, Footpad was 25/1 for the Arkle at Cheltenham Festival – look what he went on to do! A recap on last season’s National Hunt Season. The highs of the season for JPW and members. 40 Horses To Follow from JPW, along with a full write up on each horse and likely targets for Cheltenham Festival. What to expect from the upcoming season, including the key clashes. Five horses to watch, from Architect Tips, CD Racing and Rhodium Racing over at Tipsters Empire. This is one of the best and most well received ebooks in the industry over the past few years. This year’s edition is bigger and better! Absolutely brilliant value at £7.99 – there are no two ways about it! 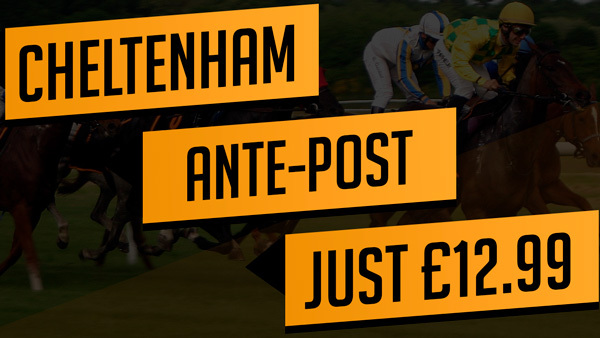 One ante-post selection for the Cheltenham Festival every week, starting Thursday 15th November. 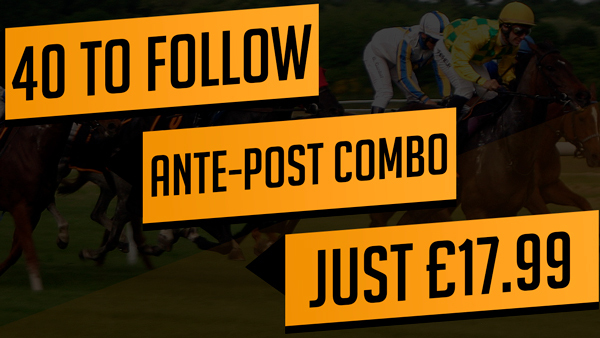 That is a total of 17 single ante-post bets before the Cheltenham Festival sent every Thursday. One Cheltenham Festival Lucky 15 per month (sent on the last Thursday of each month) – this starts Thursday 29th November. We will then send a Festival Lucky 15 with the last ante-post single on Thursday 7th March. That is five Lucky 15 bets leading up to the Cheltenham Festival. Grab yourself some discount on the cost of both! For one payment of just £17.99, you will receive the JPW 40 to Follow ebook and the Cheltenham ante-post package. 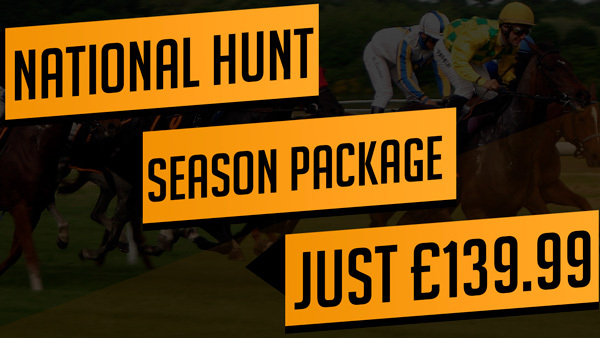 This is our best selling National Hunt package by far and represents fantastic value. 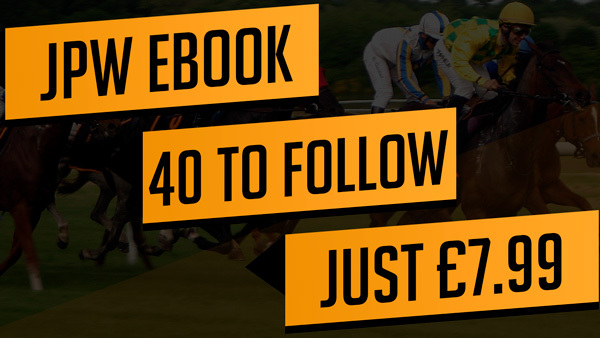 This package will get you the JPW 40 to Follow eBook and the Cheltenham ante-post package, as well as a Full-Time membership for the duration of the National Hunt season from 13th October 2018 to 27th April 2019. This is the real deal – if you add up all of the individual package costs, this really is a huge saving. That’s a grand total of £195.99. We’re offering you this package for just £139.99 – that’s almost 29% discount.